A free lending library in the lobby of our building. 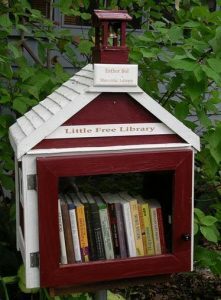 Feel free to stop by and borrow a book. 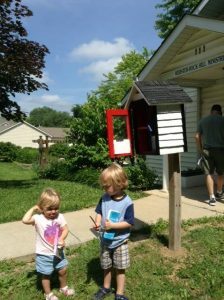 If you are unable to come by during our regular business hours or are simply walking in the neighborhood, please take advantage of our “Little Library” at the front of our offices at 111 East Waymire Avenue, Webster Groves, MO 63119. While fewer books are available on any single day, we regularly restock selections for readers of all ages. If you’re interested in donating books for our library, we do accept donations during our regular business hours (Monday through Friday 9 am until 12 pm and the 2nd Saturday of each month from 9 am until 12 noon. We are especially interested in gently used books for children and youth, which are used in the library or distributed through our tutoring summer camp programs.